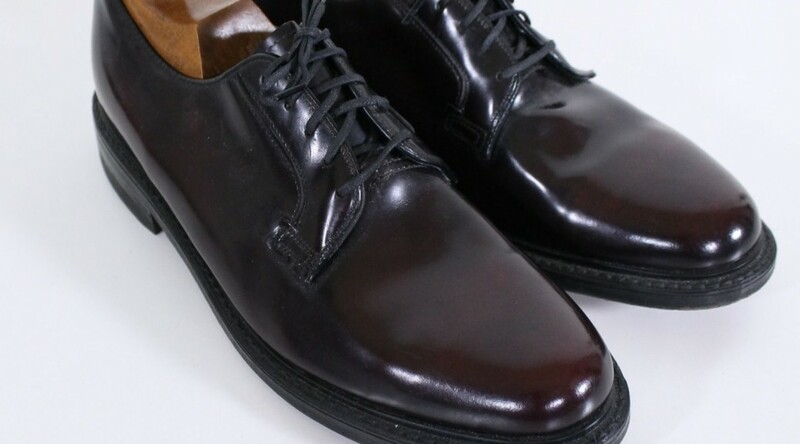 Lots of guys love Shell Cordovan shoes. The forums on askandyaboutclothes.com are filled with posts from guys photographing their argyle sheathed feet in Shell models from Alden, Allen Edmonds and Florsheim. This happens weekly (daily?). Clearly there is some obsession about Shell. What do people like about Shell? The horse leather doesn’t crease in like calf leather, it keeps a shine fairly easily, and is, well, pretty expensive and exclusive. Its like if you have a pair of Shell shoes, you are in the “Club”. People hunt eBay for Shell models because they want to be in the club too and for cheap (if possible), but used Shell shoes regularly go for $200 to $500 on eBay. You can read more about the virtues of Shell elsewhere. That is your free, quick summary. Okay, but what about this post? Why the title? The title comes from an eBay auction I watched but did not bid on. A pair of vintage Florsheim bluchers that were listed as “Cordovan” ended up going for $152 (plus shipping). And the shoes weren’t Shell but corrected grain leather and probably worth $75. But they look like Shell? Yes, they do at first glance. How do I know they are not? A few things. Usually you can tell by creasing in the leather. Again, shell doesn’t crease like cattle hide so if you see creasing, its not shell. For these shoes, since they are nearly new, there is no creasing at all. The next step would be to Google the shoe model number (“Florsheim 75849”). This search returned this post: http://www.askandyaboutclothes.com/forum/showthread.php?136735-SHell-Cordovan. The Shell models are fairly well documented (see shellcordovanmodels.com). Also if you look closely at the shoe construction, you can tell it is not a high end model. No Shell model will say “MAN-MADE INSOLE” (pretty sure). Instead of a stacked leather heel, it has a rubber and vinyl heel. Also, the welt is vinyl, not leather. 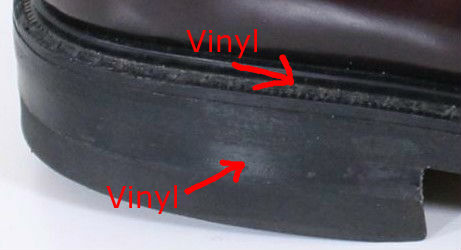 On eBay, you will see some sellers label their shoes as “Shell Cordovan” when clearly they are not. In this case, the seller implied it by listing them as “Cordovan”. A more honest seller would add to the listing description “Not Shell Cordovan”, or something like that. You will see some sellers do this. But buyer beware. I hope this helps. It was too late for this guy. Don’t you think some folks will use the word “cordovan’ in their listing to identify color? Now if they would have used the word “shell” along with “cordovan” I would agree with you that the shoes were misrepresented. So in this case I say shoes were not misrepresented. I agree this shoe was overbid. I have this pair as well as the vintage shell model and there is no comparison. Keep up the good work…really enjoy your site. Great post and love this site, keep up the great work.